Isaiah 53: Jesus? Or Jewish Nation? Isaiah 53: Prophecy that lines up perfectly with Jesus’ life! [audio:http://www.truthrevolution.tv/show/TS-0247.mp3]No Flash Support? Use this Audio Player! Dave: Isaiah 53 supposedly gives some amazing prophecies about the Jewish Messiah. 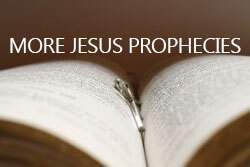 Jeff: There are at least a DOZEN very clear predictions from the prophet Isaiah, in chapter 53 alone. Dave: However, Jewish interpreters suggest that this is not a prophecy about the Messiah but rather an analogy for the suffering Jewish nation. Jeff: Well, which is it? If it’s an analogy then we cannot use it to talk about Jesus – however, if this really was a prediction about the coming Christ it’s interesting to note that it lines up PERFECTLY with Jesus’ life! Jeff: In other words, Isaiah 53 matches the life of Jesus so perfectly that nobody who rejected him liked that chapter. Dave: They had to reinterpret it. Jeff: But, it really is an astounding prophecy.